There are a large number of tricks that use the Elmsley count but it's hard to find an effect that use the Jordan count. Can you recommend some good Jordan count tricks? Bet you could find some here but it's just a guess! Cervon used the Jordan count cleverly in a four ace routine with odd-backed aces described in Ultra Cervon. The original plot is due to Lin Searles. They look identical to me, but it may depend on the grip you're using. The "Jordan Count" is a fiction created by Karl Fulves. In a routine Jordan titled "Phantom Aces" Jordan used a count that displaced a card from the 4th position from the top of a four-card packet to the 3rd position from the top. The Jordan description, however, does not include the details of how the count is performed and it is purely a displacement count, not a concealment count. We can, based on the techniques available at the time, posit that the count Jordan either used the approach of the "Ducked Elmsley" or the mechanics of what Gary Ouelett much later described as a "Paradise Count" (see Close up Illusions, 1990). Thus, despite Fulves argument for the "Jordan Count" designation, the correct attribution is "Houghton-Haxton Count." 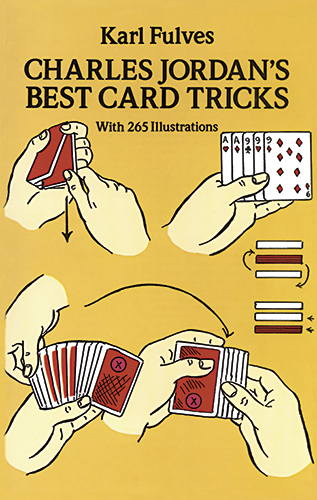 Without going into the entire history, the technique, which has great flexibility and a broad range of applications, was first submitted to Verne Chesbro--author of Tricks You Can Count On--for inclusion in Ultimate Color Separation. In broad terms, because the "Houghton-Haxton Count" conceals a card in the 4th postion and displaces it to the 3rd position, it is easy use it for its most direct application, cycling with the "Elmsley Count." (For the record Elmsley did not give the count that now bares his name any name, though he first employed it in an effect titled "The Ghost Count"). The "Houghton-Haxton Count" can also be used when a card has been added to the bottom of a packet when you wish to have it appear on the count of three when the packet is counted. This can be useful in many effects. I would call to your attention an effect by Randy Wakeman called "Backs to the Future." I also employ the "Houghton-Haxton Count" in my effect "Heisenberg Theory" (see Selling the Tough Stuff). I could go on to list a number of other effects that use or could use the "Houghton-Haxton Count," but those I've listed should get you started. Paul Gordon has the The Ultimate Transposition - he uses the Jordan count it that one. He posted a link to a performance on here recently.